“Now or Never Vol. 2” is the 4th official solo album from Seattle punchline king, Skuntdunanna aka Mafia. 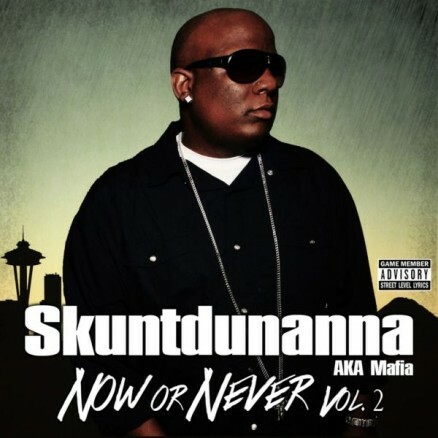 This album is the second of a two part series of unreleased material and will be the final Skuntdunanna album released by SLR. This installment features 20 tracks, with 8 songs produced by Seattle Hip-Hop veteran and West Coast Hip-Hop Award winner, D-Sane. The album also features production from Norwegian notable, Big Ice, as well as tracks from Bean One, Apoulo, DJ Roc’phella, Beezie 2000 and Mafia himself. “Now or Never Vol. 2” guest appearances include Macklemore & Ryan Lewis “Thrift Shop” singing sensation, Wanz, as well as Donte Thomas, Mechy La’Velle, Kevin B and Bad Luck.